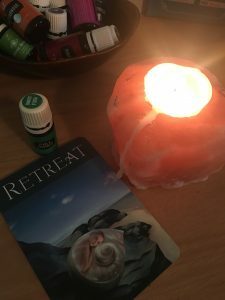 Over the years, I have discovered the value of creating Retreat as a frequent self care practice. In the past, when I have needed immediate and extreme self care, I have engaged in a half day retreat created on the fly. On one occasion, I made a pot of hot tea, pulled out some favorite magazines, lit some scented candles and put on a calming music station on Pandora. I spent a couple of hours being mindful of my breathing and surrendered to the peaceful calm retreat space I had created on my couch. 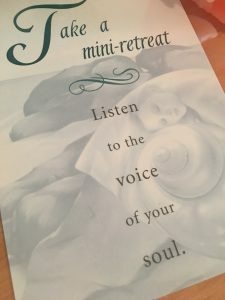 You certainly can create a more formal retreat by arranging to stay somewhere outside of your home and engage in spa treatments, a weekend of reading, hiking or eating food prepared by someone else. Whatever works for you in the moment is what you need. Be aware that sometimes when we get caught up in the idea of creating an away from home retreat, we put it off because other things like work and family responsibilities get in the way. In a coaching session many years ago, I vowed to my coach that I was going to go on a retreat to a favorite cabin in the woods after I moved my mom from Florida to Mississippi. Little did I realize how much was involved in acclimating her to the new space. 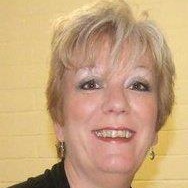 I found myself consumed with visiting her daily, along with meetings with her care team. Before I knew it, six months had gone by and the favorite cabin in the woods was now closed permanently. I’ve learned that creating retreat space could happen almost instantly if I changed my view of what a retreat had to include. Create intentional time for yourself completely dedicated to self care in whatever form that takes in the moment. Do that by listening to the voice of your soul. One of my favorite things to use for myself and my clients is a Self-Care card from a deck released by Cheryl Richardson. The Retreat card shown here is from that deck. I take a few deep breaths and pull a card for a client in a session or for myself once a week or so. Then I keep it propped up on my desk so that I am reminded of what I need to practice to achieve a greater sense of self care that week. So today, start by thinking about what Retreat might look like for you. Pick a day or several days that you will devote to Retreat. Don’t wait too long! You can create your own self care deck as well by thinking of those things that promote self care for you and creating a deck of cards. Or create a self care journal with lists of your favorite self care prompts and journaling entries when you need it most. You can continue to add to it as you begin to practice self care more often and add your favorites to the list.